To Cite: Gurbuz Y, Ozturk B, Tutuncu E E, Sencan I, Cicek Senturk G, et al. Evaluation of Prognostic Values of Tissue Plasminogen Activator and Plasminogen Activator Inhibitor-1 in Crimean-Congo Hemorrhagic Fever Patients, Jundishapur J Microbiol. 2015 ; 8(10):e26514. doi: 10.5812/jjm.26514. Background: Crimean-Congo hemorrhagic fever (CCHF) is a widespread disease in Turkey, and was responsible for many deaths in endemic regions during the last decade. The pathogenesis of the disease is not fully understood yet. Objectives: In this study we aimed to determine the levels of tissue plasminogen activator (tPA) and Plasminogen activator inhibitor-1 (PAI-1) as predictors of prognosis in CCHF. Patients and Methods: Patients who were diagnosed by the polymerase chain reaction (PCR) and IgM positivity in the reference laboratory were included in this study. Tissue Plasminogen activator and PAI-1 levels were measured by the enzyme linked immunosorbent assay (ELISA) using a commercial kit (human t-PA ELISA and human PAL-1 ELISA; BioVendor research and diagnostic products, BioVendor-Laboratorni medicina a.s., Brno, Czech Republic). Results: A total of 46 patients participated in this study. The significant differences between recovering patients and the patients who died, regarding Aspartate aminotransferase (AST), Creatine Phosphokinase (CPK), Lactate Dehydrogenase (LDH), Prothrombin Time (PT), activated Partial Thromboplastin time (aPTT), and thrombocyte and fibrinogen levels, were consistent with many clinical studies in the literature. The fatal cases were found to have higher tPA and PAI-1 levels in contrast to the patients who completely recovered. Conclusions: We think that these findings may help the progress of understanding of CCHF pathogenesis. Crimean-Congo hemorrhagic fever (CCHF) is a fatal viral infection, which has been endemic in Turkey since 2002 (1). The disease is also endemic in Kosava, Albania, Bulgaria, Greece, Iran, Pakistan, Afghanistan, the Russian Federation, Kazakhstan, Tajikistan, Georgia, Maruritania, Kenya, Senegal and South Africa (2). The CCHF virus has been found in many species including horses, donkeys, goats, cattle, sheep, and pigs, yet human beings are the only known host of CCHF virus, in which the disease is manifested (3). The CCHF viruses are transmitted to humans by Hyalomma genus ticks, particularly by Hyalomma marginatum marginatum. The dominant tick species in Turkey were found to be H. marginatum in humans, cattle and sheep (4). The CCHF virus antigens were also found in Hyalomma excavatum, Haemaphysalis parva and Boophilus annulatus ticks collected from cattle and Rhipicephalus bursa ticks from sheep (4). Crimean-Congo hemorrhagic fever is an acute viral hemorrhagic disease with a mortality rate of 3 to 30% (5). The signs and symptoms of the disease include headache, fatigue, muscle aches, abdominal pain, nausea, vomiting, diarrhea, hemorrhage and high fever. The pathogenesis of CCHF is not fully understood. It is thought that vascular endothelial damage might play an important role in the pathogenesis of CCHF (6). The patients may exhibit rapid deteriorations in biochemical and hematologic parameters (3). Fatal cases usually develop disseminated intravascular coagulation (DIC) and multi-organ failures (7). Many studies have suggested that cytokine and adhesion molecules can be used as predictive markers in severe cases (7-11). Hyperfibrinolysis and disordered balance of fibrinolysis are proposed steps in the etiology of multi-organ failure in severe viral hemorrhagic fevers (12-14). In this study our aim was to determine the levels of tissue Plasminogen activator (tPA) and Plasminogen activator inhibitor-1 (PAI-1), which are important for hemostasis in CCHF cases. The patients who were diagnosed by positive polymerase chain reaction (PCR) and IgM results at the reference laboratory were included in the study. The demographic data, initial biochemical values and hematologic counts were recorded. The patients who lacked laboratory results for the first five days of the disease were excluded. Tissue Plasminogen activator and PAI-1 levels were studied by a commercial enzyme linked immunosorbent assay (ELISA) kit (human t-PA ELISA and human PAL-1 ELISA; BioVendor research and diagnostic products, BioVendor-Laboratorni medicina a.s., Brno, Czech Republic). The study protocol was reviewed and approved by the ethics committee for clinical researches of Diskapi Yildirim Beyazit training and research hospital (clinical trial registry number 22/11). The SPSS 15.0 program and Mann-Whitney U test was used for statistical analysis. For correlation analysis, the Pearson’s test was preferred and P level was accepted as < 0.05. Forty-six patients enrolled in this study; twenty-four (%52.2) were male and 22 were (%47.8) female. The mean age was 48.8 (SD: 17.4; 15 - 85) years. Eight patients (17.4%) died, while 38 (82.6%) cases recovered. The levels of Aspartate Aminotransferase (AST), Alanine Aminotransferase (ALT), Creatine Phosphokinase (CPK) and Lactate Dehydrogenase (LDH) were found to be higher in fatal cases when compared to the recovered patients. Also aPTT and PT were significantly prolonged in non-survivors. Thrombocyte counts and fibrinogen levels were significantly lower in fatal cases. The differences regarding AST, LDH, CPK, PT, aPTT, thrombocyte and fibrinogen levels were statistically significant amongst the two groups (Table 1). aAbbreviations: ALT, alanine aminotransferase; aPTT, activated partial thromboplastin time; AST, aspartate aminotransferase; CPK, creatine phosphokinase; LDH, lactate dehydrogenase; PAI, plasminogen activator inhibitor; PT, prothrombin time; tPA, tissue plasminogen activator; WBC, white blood cell. The tPA and PAI-1 levels were significantly higher in fatal cases than patients who recovered (Table 1). 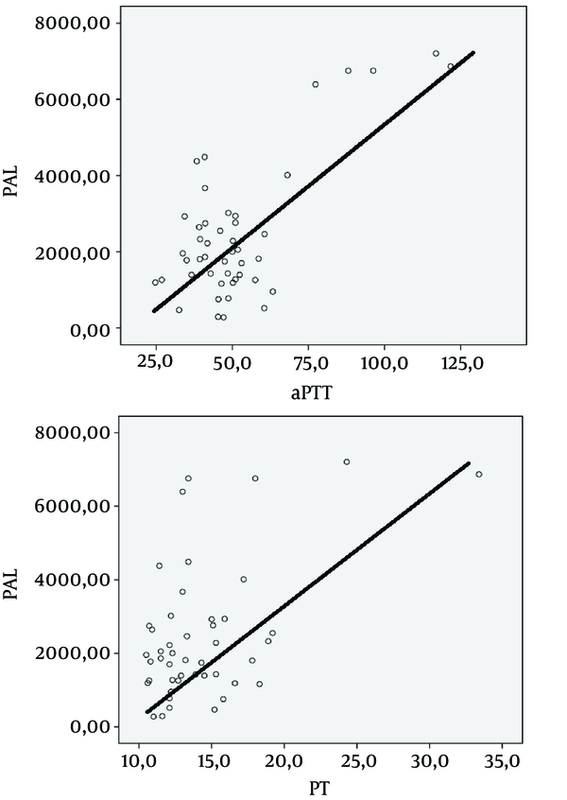 The PAI-1 levels exhibited a positive correlation with PT and aPTT values (PT: r = 500, P < 0.001, aPTT: r = 724, P < 0.001) (Figure 1). Crimean-Congo hemorrhagic fever is a severe tick-borne viral disease with high mortality and has been endemic in Turkey for more than ten years. The reason why some patients have a negative outcome while others recover is not fully understood. The pathogenesis is still unclear. Vascular endothelial injury may be the major disorder in the background (6). Thus, new studies on the pathogenesis of CCHF may contribute to existing treatment modalities. The incidence of mortality in our country is nearly 5% for CCHF cases (15). In our study, mortality was found to be higher than the reported level (17.4%). This may be related to the fact that our hospital is a tertiary hospital with level three intensive care units. Therefore, the patients who were least expected to recover were sent to and followed up in our hospital. Overall, 52.2% of the patients were male with a mean age of 48.8. Most of our cases were rural workers, which was coherent with previous data. However, it is possible for CCHF to be found amongst all age groups in Turkey. The CCHF patients may exhibit rapid deteriorations in biochemical and hematologic parameters during their follow-up. The most prominent alterations include: a rise in liver enzymes and bleeding times and a decrease of thrombocyte counts and fibrinogen levels. Many studies were performed that analyzed these parameters to determine prognostic prediction rules (16-21). In accordance with the literature, our study found statistically significant differences in AST, LDH, CPK, PT, aPTT, and thrombocyte and fibrinogen levels between fatal cases and recovered patients. Hemostasis is mostly impaired in severe viral hemorrhagic fever cases. In a normal body, hemostasis is balanced between clotting and bleeding poles and controlled by two main mechanisms. Primary hemostasis involves vascular contraction, thrombocyte activation and aggregation steps. Secondary hemostasis is mainly maintained by activation of clotting cascade, and formation of clot and lysis (12). The fibrinolytic process is controlled by tPA and PAI-1 levels (22). Tissue Plasminogen activator activates production of plasmin from plasminogen and leads to destruction of fibrin and accumulation of end products. However, PAI-1 acts as an inhibitor of fibrinolysis; it inhibits regeneration of plasmin (12). Increased production of tPA in endothelial cells was reported in Dengue hemorrhagic fever (DHF) patients (14, 23). Serine protease inhibitor of PAI-1 was further shown to effect fibrinolysis, sepsis and fever events (24). Vascular endothelial injury was reported to be an important step in many studies for the pathogenesis of viral hemorrhagic diseases (6, 8). A study of Dengue fever patients pointed out that acute cytokine release was the main factor for endothelial damage instead of a physical injury (12). These cytokines trigger coagulation and in fact contribute to tPA production. Also, a subsequent rise of tPA leads to hyperfibrinolysis in the next step. Fibrin deposits and plugs are the end products of this process. These interactions lead to the final result of hipoperfusion of tissues and multi-organ failure (12-14). Moreover, there are many studies linking hyperfibrinolysis and bleedings to the pathogenesis of hemorrhagic fevers (14, 22, 25-27). The literature review revealed that the effects of tPA and PAI-1 levels have only been studied in DHF and Argentine hemorrhagic fever (AHF) patients. These diseases are also viral hemorrhagic fevers, which may eventually lead to DIC and organ failures (12-14). A study from Thailand by Sosothikul et al. reported that high PAI-1 levels were correlated with poor prognosis in DHF patients. In addition, they found a significant positive correlation between bleeding scores and aPTT, PT and plasma tPA, and a significant negative correlation between bleeding scores and platelet counts (25). A similar study in DHF patients from Taiwan reported that a rise of tPA and IL6 levels was a prominent feature in patients with septic shock after observation for 48 hours (28). Another study of DHF patients demonstrated a correlation between disease severity and the fibrinolysis process. It was shown that there was an acute rise in tPA and a subsequent PAI-1 increase in these patients (23). A study of AHF patients found elevated levels of tPA in all cases while more severe cases tended to have higher PAI-1 levels (27). Several previous studies demonstrated an acute rise of cytokines and adhesion molecules such as IL-6, IL-8, TNF-α, ICAM-1 and VCAM-1 in CCHF patients (7-11). To the best of our knowledge, this is the first report regarding tPA and PAI-1 levels in CCHF patients. The results of this study demonstrated that tPA and PAI-1 levels were significantly higher in fatal cases than in recovered patients. Plasminogen Activator Inhibitor-1 levels exhibited a positive correlation with PT and aPTT values. We think that these results may, in fact, contribute to the understanding of CCHF pathogenesis. Supportive therapy is essential in CCHF patients (6) and any antiviral drug therapy or vaccine is not yet available. Jiang et al. suggested that prophylactic treatment against blood coagulation and the imbalance in fibrinolysis system is critically important to prevent pathogenesis and development of severe symptoms such as hemorrhage for patients at the acute stage of DHF (22). Huang et al. suggested that therapeutic intervention to prevent plasmin activation in the acute stage might be beneficial to prevent complications in DHF (23). The suggested treatment options for DHF by the authors may also be considered in CCHF. The major limitation of our study was the small sample size making it difficult to generalize the results to a larger population. However, this study provides initial evidence that tPA and PAI-1 may contribute to the pathogenesis of CCHF. In conclusion, higher levels of tPa and PAI-1 were correlated with higher mortality rate in CCHF. The imbalance of the fibrinolytic system in fatal cases shown in this study may contribute to the understanding of pathogenesis. Moreover, these results may further contribute to the development of new therapeutic options other than supportive treatment in the future. Authors’ Contributions: Yunus Gurbuz, Baris Ozturk and Emin Ediz Tutuncu designed the research plan, organized the study, participated in all the experiments and coordinated the data analysis. Irfan Sencan, Gonul Cicek Senturk and Fatma Aybala Altay contributed to the writing of the manuscript.